Each rental includes delivery, set up and take down of a birth or birthday announcement yard sign that includes a personalized bundle/plaque for you to keep. Does someone need to be home when the stork/sailboat sign rental or cupcake announcement is delivered? No, there does not need to be anyone at the delivery address for the lawn signs to be delivered and set up. If you have special instructions on where to place the yard sign, please let us know. Can I attach balloons to the yard sign? No, balloons should not be tied to the sign, since they often pop in the hot sun. The latex then bakes onto the sign causing permanent damage. How do I pay for my stork lawn sign or birthday cupcake sign? We accept all major credit cards. You may place your sign order by emailing us at storksandmoreofdallas@gmail.com or by calling us at 270-776-1104. All rentals must be paid in advance before we deliver, no personal checks. 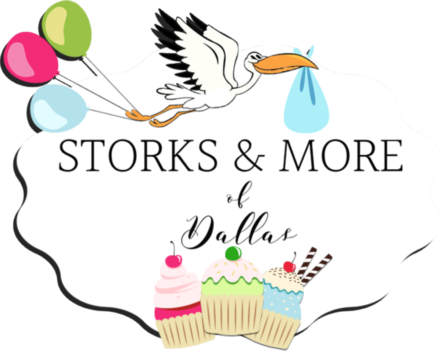 Where does Storks & More of Dallas deliver? Can I mow my lawn while the stork yard sign or birthday announcement is in my yard? If you mow your yard during the sign rental, please be careful around the sign. Please avoid trimming close to the base of the sign and using a blower around it, it will damage the sign. Please do not move the sign. Thank you for taking care of our signs during your rental so that others can enjoy them too! As soon as the baby is born, call us to reserve a stork lawn sign. We will need the correct spelling of the baby’s first and middle names, weight, length and date of birth. We also need you to provide us with the delivery address and phone number. We will also need to know if there is a gate code, security guard, or if there is a sprinkler system in the yard. When the baby arrives just give us a call or email us. We try our best to deliver within 24 hours and strive to be there before the baby gets home. The sooner you contact us after the baby is born the better, so we can reserve a stork just for you. If the stork is for a baby shower please contact us in advance so that we can make sure to have a stork lawn sign reserved for your party. 1. We are unable to gain entrance into a gated community. 2. The security guard refuses to allow us to gain entry to the community. 3. The homeowner or recipient does not allow us to set up the sign or calls us to request that we pick up the sign prior to the end of the rental period. 4. A dog or other animal is threatening or refuses to allow us onto the property.